Jeff and Jan are our Lodge Managers. Married now for 14 years, they bring a creative touch to both lodge locations. We refer to Jan as 'Mother Jan' and let me tell you, she will not ... morehold back in letting you know what needs to be done. Love these two; Yes they work for us, but more than that they are friends, salt of the earth and REAL people. We are incredibly fortunate to have them in the family. Jeff has been around the fly fishing game for a LONG time. With over 28 years in the Industry participating in all dimensions of operation from 17 years in Tierra Del Fuego, 7 years in the Kola Peninsula as a guide to 8 years in Colorado guiding on the famed waters to owning a Fly Shop and to now managing both Black Bear Lodge and The Steelhead Ranch, Jeff is a seasoned veteran. Aside from all of that, he has raised more Klick Steelies on a dry fly than anyone I know! Father to three beautiful children; Lauren, Kelsey and Justin. Jack started fishing at the early age of one. The first 16 summers of his life were spent fishing at Neah Bay, with his parents and grandparents as "Kelpers" - catching and selling salmon caught in the Straits of Juan de Fuca and the Pacific Ocean. Prior to the families years at Neah Bay, Jack's grandfather owned a very well known fishing resort on Camano Island called Camp Lagoon, where he hosted thousands of people on fishing excursions. During his 16 years at Neah Bay, he spent 4 years as a bait boy on the top two Charters Services. When he wasn't in the boat fishing the ocean he was by foot and/or bike fishing for sea run cutthroat in numerous local creeks on the reservation. After high school Jack went on to college at Washington State University and was on the 7 year plan for his BA in Sport and Recreation Management. While at college he fished, hunted and played a large amount of Rugby, hence the 7 year plan. 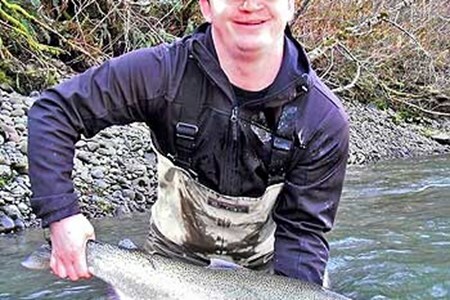 Soon after graduation he found himself in Ellensburg and realized that his love of fishing had brought him to the right place. Jack, The Evening Hatch and his guide staff have been featured in numerous media publications over the years. . The company goal is and always has been to have fun on the water, provide you with an enjoyable fishing experience, teach you some new technique, and create appreciation for the wonderful resource; We thank you for your continued support. Favorite One Liner - Nooiiccee! 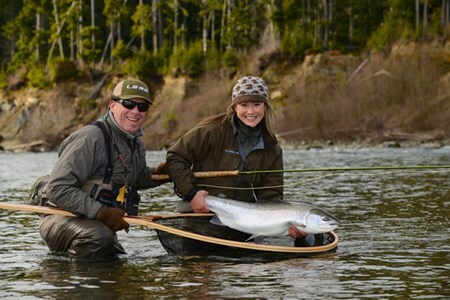 Trey has lived a long and illustrious carreer in fly fishing. 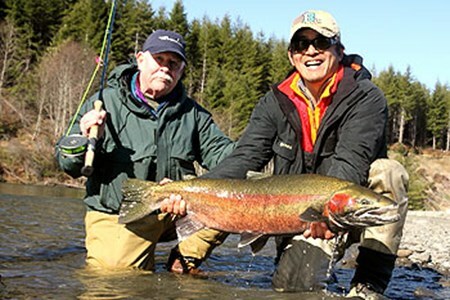 He is most well known for authoring 'Steelhead Fly Fishing' and 'Blue Water Fly Fishing'. He has been an advisor for countless ... moreequipment manufacturers including but not limited to, Thomas and Thomas, CF Burkheimer and Sarcionne. Aside from his incredible prowess in actually catching fish and then writing about the insight in doing so, Trey is a masterful teacher. 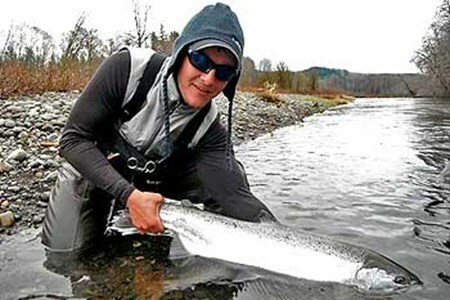 He was part of the 'cutting edge' of Steelhead and Blue Water flyfishing. He was making shooting heads before 'shooting heads' were cool. He has fished ALL OVER the WORLD with too many places to name. Aside from all of that, Trey is a 'nice guy'. We are fortunate to have him on our crew in an advisory/host capacity and most of all a good friend. Kevin Mahaney grew up in Ellensburg and has been fishing the Yakima river and it's tributaries all of his life. After attending Central Washington University for two years, Kevin moved ... moreto Driggs, Idaho to ski and fish bum before he returned to Washington where he completed his degree in business marketing at Western Washington University. 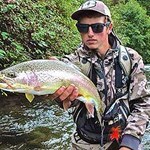 While Kevin attended Western he was the marketing intern for Fly FishJournal, one of the industries premier fishing magazines. 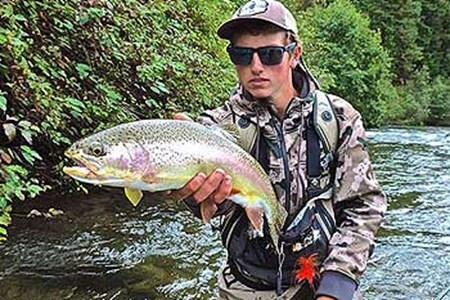 During his break from school in Idaho's Teton Mountains, Kevin was able to devote more time to his passion for fly fishing on waters like the Henry's and South fork's of the Snake River. Because of this experience Kevin brings a technical approach to The Evening Hatch that includes an unsurpassed knowledge of hatches and how to catch big trout on dryflies. Along with his ability to catch fish, Kevin brings his pastwork experiences in the customer service and fishing industries together to teach anglers of all skill levels, especially those new to the sport, how to up their game. Kevin is absolutely one of the most personable and likable people you will ever meet, in or out of a fishing boat. Ricky reminds you of the boy next door. Don't let that appearance fool you as his fishing and casting prowess is top notch. Quite frankly, his two hand rod skills are borderline world ... moreclass. He has an awesome demeanor about his approach to the day and he is as nice as the day is long in June. Well versed in all tactics with both the two hander and the single hand rod, we are happy to have his prowess on our team. 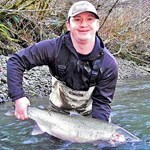 Ricky spends most of his time with us on the Olympic peninsula, Yakima and Klickitat. It all started at age nine when his Dad handed him a UPS fresh Cabelas kit rod. From then on, his bike was the Ford and the SF Snoqualmie was the Madison. Resident Coastal Cutthroat ... moretaught him all the basic stream skills anyone just had to know and growing up on the Northwest's native trout couldn't have been any more nostalgic. Every beaver pond and trickle in the Upper Snoqualmie Valley was explored, and a thirst for adventure was ignited. At sixteen he got his ford, and it was game on. He explored the stillwater scene heavily on waters like Lenice, Nunnally, and the famous Seeps and with his old man's boat in tow explored and learned Eastern Washington's reservoirs with Smallmouth in mind. Banks, Potholes, and Lake Roosevelt have been good. Beach fishing sparked an interest and the Puget Sound became and still is one of his favorite fisheries. 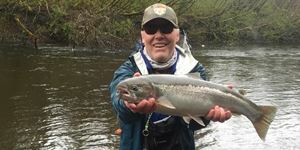 His favorite trout's anadromous form was the target more often than not, and many wonderful days have been spent on the salt, including a good number on the state's north coast, Neah Bay, targeting migrating Coho and Black Bass on the fly. 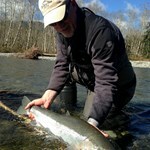 Favorite One Liner- Steelhead are where ya find em......so go find one! Joe first picked up a rod on the banks of the ever so mighty Tin Cup Creek outside of Darby Montana. At the age of 12 he was literally hooked, in the back of the head, the ear, and ... morethe face. It’s amazing how a few dozen 6 inch Trout can alter the course of a boys life. Joe is passionate about catching fish. He has journeyed far and near in his pursuit. He considers fishing to be the delivery device of life’s greatest gifts his friends, family, and memories. 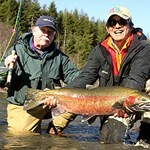 Since his days on Tin Cup Creek Joe has fished as far South as New Zealand and as far North as Alaska. His love of adventure and extensive travel experience make Joe a great resource for our destination packages, our lodge, and any of our clients searching for new journeys. Joe is a Seattle native where he currently resides with his wife and two young children. He has a house full of girls and cannot wait until they are ready to become part of the family business. One Liner - "Who loves you Baby?" 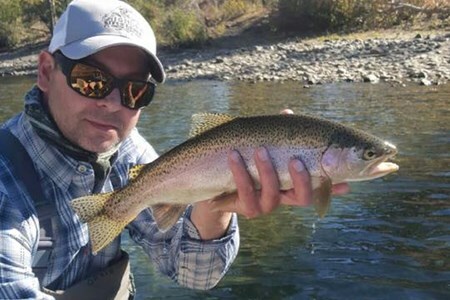 Steve Worley is the owner and operator of "Worley-Bugger Fly Co." The base of operations for this fly fishing outfitter service is headquartered in Ellensburg, Washington. 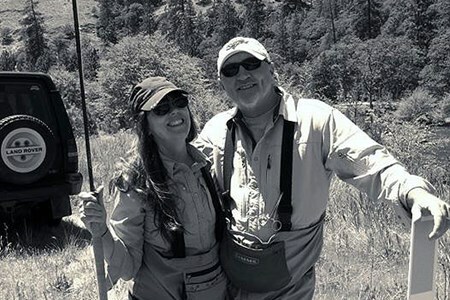 Here, Steve ... morehas trained his staff of fly fishing professionals to conduct guided fly fishing adventures throughout Central Washington, with their primary focus on the Yakima River since 1996. 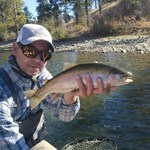 Worley Bugger Fly Co. also operates the areas first and foremost premier professional fly fishing shop. "Our staff of fly fishing professionals has been meticulously assembled and selected around local, highly knowledgeable fly fishermen." Over the past several years, our staff has worked tirelessly to assemble Central Washington's foremost pro and fly shop. 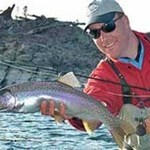 We are recognized and respected as the leading authority on Central Washington's fly fishing. Our staff is prepared to show each of our guests the beautiful Yakima river along with a host of other exciting Washington fisheries." Steve's interest in the outdoors, began at a very young age while growing up in the mining city of Butte, Montana. Steve recalls that "Outdoor recreation was always a part of our family life. Fishing, hunting and camping in the wilds of Southwest Montana was a influential portion of my life as a young man. During the spring and summer months, weekends were divided between camping in the Pioneer Mountains of the Wise River, a small tributary of the Big Hole River, or in the Bernice area north of Butte. Here, a family ranch has existed since the early 1900's. Our days as youths were spent fishing the small creeks and beaver ponds of Red Rock Creek. The fish were plentiful and we spent much our carefree time, wading up and down the shores of the small creek. In the summer of 2006, my daughter Jacqueline caught her first Brook trout here on a fly. Another pastime during the summer months was trail bike riding into the high mountain lakes of Southwest Montana. Here big rainbows and cutthroats were the primary target. During the months of Autumn and Winter, our interest turned to archery and big game hunting for mule, whitetail deer and Rocky Mountain Elk as well as skiing and snowmobiling the rocky slopes of the Continental Divide. 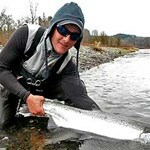 Aron was born Kittitas County and grew up in Roslyn, Washington in an outdoor family lifestyle fishing and hunting. Roslyn, a small 1800’s mining town located northwest of Cle Elum, ... morewhere hardened miners staked there claims in gold, silver and coal was made infamous from the 1990’s television show “Northern Exposure”. Most people living in and around the Pacific Northwest are most familiar with the Brick Tavern located on the corner of the main street in Roslyn, where locals like to congregate to cool off in the summer and warm up with a good drink in the winter months. Aron avidly pursued fly fishing from a very young age and honed his fly fishing skills on the Yakima River as well as many of the smaller tributaries that feed the blue ribbon stream. Like most of us, Aron was mentored in his fishing and took to it very naturally as a young man. In the early stages of his adult life, Aron headed to the North Country of Alaska to guide fishermen from all over the globe for a variety of fish like Arctic Char, Sockeye Salmon and large Rainbow Trout as well as Grayling and Northern Pike. Here, he honed his river skills with flies as well as the challenges of oaring and safely maneuvering a boat through the untamed wilderness areas. Aron spent many seasons on the rivers of the north, guiding people through the Fishing Bear Lodge in Tikchik River Region of Alaska. Aron is a family man and has been married for over ten years to his wife Cheryl. They have two children and one grandchild. 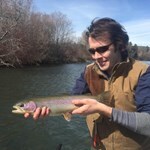 Looking for the best guided fly fishing trips in Ellensburg, Washington? 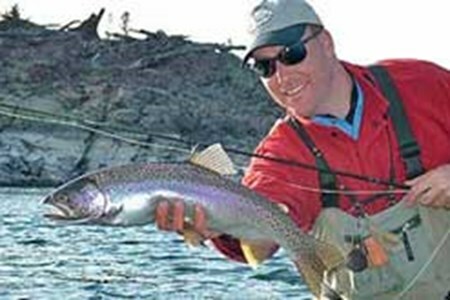 Choose from the top Ellensburg, Washington fishing guides. 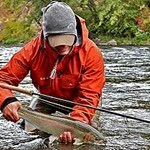 Read reviews, compare prices and check availability for fly fishing guides in Ellensburg, Washington. 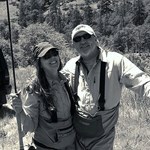 Yobi Adventures has everything you need to plan a Ellensburg, Washington fly fishing vacation. 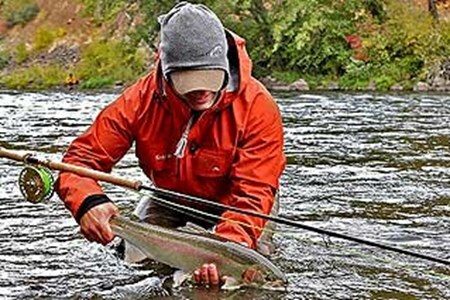 Find the right fishing guide for your Ellensburg, Washington fly fishing trip. With hundreds of fishing guides to choose from, Yobi helps you plan the perfect fly fishing adventure. 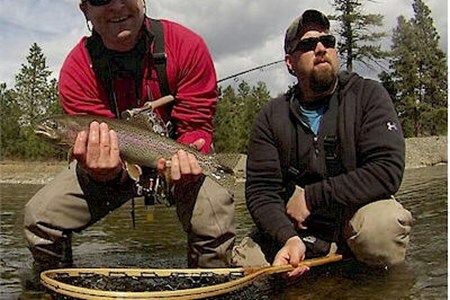 Browse the top fishing guides in Ellensburg, Washington and book a trip online.